Category Archives for "Book Review"
Cooking is not just an activity that involves you sweating it out in the kitchen, but it is an art in itself. If done correctly and patiently, using the right ingredients and techniques, you don’t just whip up great dishes, but create memories that will linger on in the mind of those who are lucky enough to eat it. In Cooked: A Natural History of Transformation by Michael Pollan, published in 2013, the author explores the impact of four of the most powerful elements of nature – air, water, fire and earth – on the food that we eat. From baking to fermenting, he experiments with some of the best chefs in the world to discover how beautifully these four elements shape and cook the food that we so love to eat. The entire world pauses to read a culinary book that is written by the renowned journalist, Michael Pollan. 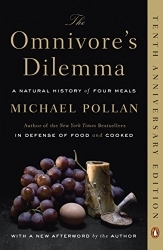 It is no wonder that after penning down several critically acclaimed non-fiction books based on food and culinary science such as In Defense of Food: An Eater’s Manifesto and The Omnivore’s Dilemma: A Natural History of Four Meals, his next piece of work, Cooked: A Natural History of Transformation, has taken the world by storm. It is difficult to find an author as passionate about food and the role it plays in the evolution of mankind as Pollan. So the book certainly deserves your attention if you love food. Readers have loved how the food systematically breaks down into the four sections of fire, air, earth and water giving ample explanation of how each of them shape and cook the food separately in their own unique way. It will take you on a journey starting from the basic techniques of cooking to how they have evolved over the centuries, and how this evolution has shaped our society and inter-personal relationships. The book also makes a point to remind its readers how the modern man is losing his touch with the real methods of cooking. Relying on processed food to take care of our nutritional requirements weakens us and the entire cycle of ecological inter dependence. In fact, the author claims that by adopting a healthier cooking practice, we can fight health issues successfully and go back to restoring our disturbed relationship with nature. In 2016 Pollan and Alex Gibney turned the book into a 4-part documentary series released exclusively on NetFlix which brought stunning visuals to Pollan’s story. Cooked: A Natural History of Transformation is 496 pages long and currently available on Amazon in Kindle, Hardcover, Paperback, Audible, Audio CD formats. 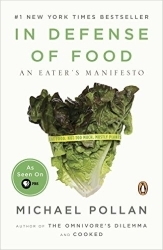 Michael Pollan is also well known for his phrase, “Eat food. Not too much. Mostly plants.” from his book In Defense of Food, as well as his book The Omnivore’s Dilemma, and various other books, documentaries, and lectures (e.g. Michael Pollan: “Cooked: A Natural History of Transformation” | Talks at Google). Whether you’re an avid sushi lover, or just intrigued by this globally loved dish, The Sushi Economy: Globalization and the Making of a Modern Delicacy by Sasha Issenberg will satiate all your curiosity as far as this Japanese dish is concerned; this sushi biography is thoroughly researched, well articulated and makes an interesting read. Sushi was, at one point, just a local Japanese street food and the tuna fish that is most commonly used for making it, was sold at scrap value. However, currently, this fish is one of the most expensive ones in the market while sushi has found its way to the best Michelin star restaurants, scattered all over the world. The book traces the sushi’s journey from humble beginnings to becoming one of the most luxurious dishes on the menu in the 21st Century. Being an experienced and a credible journalist, Issenberg, has brought the same curiosity and an interesting writing style to this book. The vivid and detailed narration takes into account every aspect of the sushi business – right from the catching and transportation of fish to serving that sushi on the plate! Readers will be able to vividly imagine the Tsukiji fish market and the religious arrangement of the dish on the plate. It’s all out there for the reader to imagine, smell and taste. The book vividly discusses the Tsukiji fish market that covers 57 acres in the capital city of Japan and trade worth $6 billion are annually carried out over here. Along with that, it beautifully narrates how the sushi has changed over the years – from taking birth in the 19th century to being revamped when Japanese planes came back with North Atlantic Bluefin Tuna instead of flying back empty. Meant for the foodie, the economist and the hungry reader as well, this book is nothing less than a delight to read. What sets this book apart from most of the other sushi guides is that it is not just a bland narrative on the development of sushi into a globally loved dish, but also takes into account the tiny details like kitchen scenes in the restaurants as well as how it has taken advantage of globalization to enjoy the enviable position that it has today. A bonus is that this book also discusses the economics of sushi deeper than many others out there on the bookshelves. The Sushi Economy: Globalization and the Making of a Modern Delicacy is 351 pages long and currently available on Amazon in Kindle, Hardcover, and Paperback formats. Sasha Issenberg has also written several other highly rated non-fiction books. Tea: History, Terroirs, Varieties (Second Edition) by Kevin Gascoyne, Francois Marchand, and Jasmin Desharnais is great book on tea because it thoroughly provides an overview of tea’s history, different varieties, growing and harvesting process, fascinating ceremonies, local methods of preparation, tasting notes, and infusion accessories. A lot is covered in this book on all of the topics a beginner, or even a more experienced tea drinker, would be interested in. But the really special part of this book is the massive collection of photos. 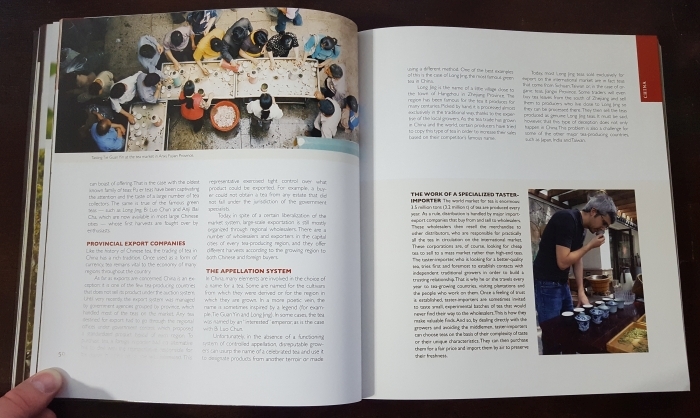 Nearly every page contains one or more images from around the world and really brings the topic of diversity and complexity of the tea industry to life. If you’re new to tea, you’ll be amazed by how many different colors of tea there are. 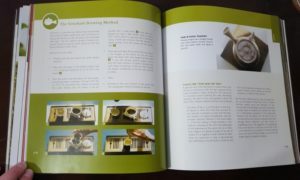 The book also explores the world’s top tea-growing countries to explain the common characteristics of that nation’s tea. Examples of countries covered in the book are Japan, Taiwan, China, Sri Lanka, India, Vietnam, and Nepal, and the region of East Africa. After reading this book, you’ll learn how climate and soil influence’s a tea’s characteristics. Terroirs is the lingo used to refer to these factors. You’ll also learn about the different tea families, grades, cultivars, and varieties. The section on tea’s history includes a timeline for easy reference. 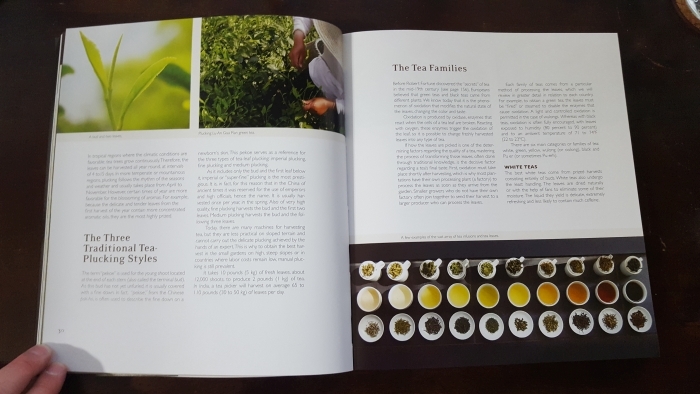 This book is a well-rounded, thorough book on tea that even includes interviews with industry leaders and 15 gourmet recipes that use tea as an ingredient. 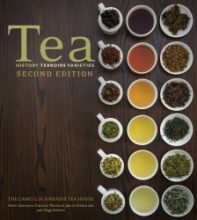 Tea: History, Terroirs, Varieties (Second Edition) is 272 pages long and currently available on Amazon only in Paperback format. The Story of Sushi: An Unlikely Saga of Raw Fish and Rice by Trevor Corson (previously titled, The Zen of Fish: The Story of Sushi, from Samurai to Supermarket), intertwines history with entertainment. Corson focuses on the story of a young woman named Kate, described as a fun down to earth girl who was athletic and one of the guys until she broke a finger in High School. Unable to play sports anymore she became depressed and developed an eating disorder. As her depression and eating habits grew worse a friend recommended Kate try sushi. Hesitant at first Kate tried it and ended up loving it. Seemingly, more than the sushi, Kate enjoyed the attitude of the chefs who were comical and outgoing, reminding her of herself before getting sick. As Kate continued visiting this sushi bar her overall health improved. As she pondered her future, she knew she wanted a career in which she could build friendships with customers, helping them to enjoy life. As if it was fate, Kate saw an ad for the California Sushi Academy. After a year of debating, she walked out on a leap of faith, leaving everything and everyone behind on a quest to be a sushi chef. The California Sushi Academy, California’s first Sushi Academy, consisted of an extensive 12-week training program. Corson explains how this is different from Japan where sushi apprentices spend 5 years or more just learning to make the rice before being allowed to handle anything else. The sushi-related history and culture lessons carefully woven into Kate’s story were very interesting and informative. Corson brought his readers through sushi’s humble beginnings in Japan to its worldwide fame today. Corson did a good job painting a picture allowing his readers to “see” exactly what he was talking about. Scenes displaying Japanese culture like the auctions at the Tsukiji fish market in Tokyo, the history of Japanese knives and even the use of Japanese terms throughout the book tied the culture in nicely. The history of the food itself was also interesting. The precision put into preparing meals requires lots of practice. The process of making certain foods like miso and soy sauce were eye opening and the natural history of the different types of fish and how to catch/farm, cook, and/or present them was informative. Some of the other facts mentioned by Carson that were particularly interesting is that the California Roll was invented due to a Californian sushi chef running out of fatty tuna; the term mack daddy was derived from mackerels, and that the organisms eaten by flamingos are responsible for their color. Overall, the book was interesting and educational. Carson’s choice to focus on Kate, instead of others in the class, was smart because Kate being new to Sushi and Japanese culture, like many of his readers, was a nice relatable gateway to the “story of sushi”. The Story of Sushi is 388 pages long and currently available on Amazon in Kindle, Hardcover, Paperback, and Audible formats. Trevor Corson also wrote The Secret Life of Lobsters: How Fishermen and Scientists Are Unraveling the Mysteries of Our Favorite Crustacean which is also available on Amazon in several formats. We publish short guides on a variety of food and drink topics. Enter your email below to get future updates on 27Press books, giveaways, and special events.